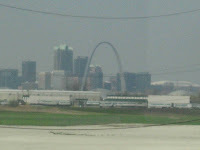 As we left Oklahoma City, we had planned a leisurely trip thru Missouri, Illinois, and Indiana before arriving back in Toledo. Unfortunately, we found ourselves between several severe weather patterns crossing the plains promising possible tornadoes and grape fruit size hail. It seemed to be the prudent thing to push northeast to Toledo as quickly as possible, so we returned just under two weeks ago. We have been adjusting to being back in a stick house after nearly six months in the motorhome. 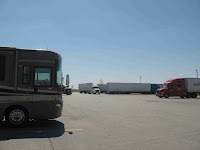 During this jaunt, we visited 16 states and stayed in 32 campgrounds, while putting just under 7000 miles on the motorhome. There were many thousands of pictures taken, family and friends visited and new places discovered. It was, overall, a great trip and we are sorry to see it end. 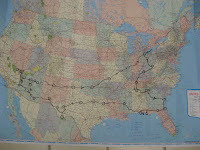 The good news is that we hope to be back on the road with our summer adventures within the next few weeks. 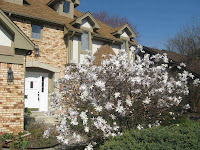 We have already taken care of many of the items on the list to get accomplished with the house (still waiting for that perfect buyer) and many of our annual chores. We are looking forward to seeing friends we have not seen in many months. We already got together with our Winnebago and Dutch Clubs for some good food and conversation. We visited our beautiful Botanical Garden which is just coming in to bloom and is a stark change from the desert southwest. This trip again demonstrated the wonderful things that can be seen and done inside the borders of this great country. There are still so many sites to see and places to go. 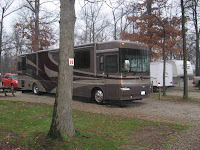 I can only hope that we and the motorhome will hold up to do it all! 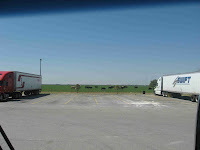 This blog will continue to be updated regularly. Oklahoma City has pulled itself out of the doldrums it was in after the oil and gas crash of the 1980’s and has significant growth in business and leisure. It has started a new entertainment district know as Bricktown with shops restaurants, nightclubs and condo living. It seems to be trying to emulate a similar area in San Antonio, including the canal and boat rides. While it is still in the development stages, it seems to be off to a good start. The City has also seen its share of recent tragedy from home grown terrorism. On April 19, 1995 a truck loaded with explosives parked in front of the federal Building and detonated, and destroyed the building and damaging some surrounding structures. 168 people lost their lives in that attack. On the site of the attack a national monument and museum has been erected to remember those who lost their lives that day, including a number of children from the day care in the building. There are a 168 chairs arranged in rows reflecting the floor that person was on when the blast came. It is an impressive and sobering memorial. On our last day, we visited Anadarko, Indian City USA to visit the museum and display of Indian villages of the west on display. It is a 45 minute guided tour of the villages with a bit of history of each tribe and what their lives were like. We were here in 1981 during the annual Indian POW WOW in Anadarko. The old down town was busy and striving. Since then a large national chain mega store has moved in and the old town looks to be hurting. Oklahoma City was the next logical stop on our push east and it also happens to be a city I was stationed in for four years back in the 70’s. It is also where my oldest daughter, Gretchen, was born. We stayed here for several days to look the place over and see what has changed. Not surprisingly, quite a bit. The city has grown and looks to be prospering. We looked at my old house, which seems to have held up really well and the airport where I spent a lot of my spare time flying small airplanes. Our first tourist spot was the Cowboy and Western Heritage Museum, which has grown to three times the size it was when I lived here. 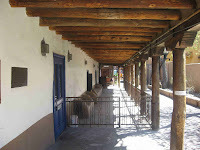 This is a massive complex which provides a solid look into the history of the west and the cowboy experience. It also has many exhibits on the Native American experience, as well. There is a large exhibit on the west in movies and TV. This brought back many childhood memories. Unfortunately photography was not allowed in many of the halls. If you have a real interest in these subjects, you could spend many days in the museum and still want to come back for more. 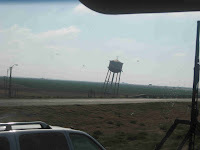 There is a complete small cattle town staged at sunset, 1300 different types of barbed wire collection, extensive history of rodeo, cowgirls, trail drives, and on and on. The art exhibits and gun collections alone are worth the visit. 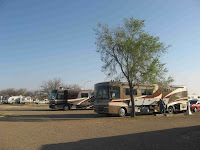 We stopped for the night at the Amarillo Ranch RV Park on the East side of the city. It was a very nice park with friendly staff. 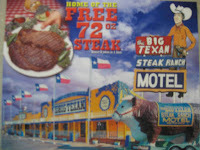 The lady behind the counter recommended a locally famous restaurant called the Big Texan that has a free 72 oz (about 2 kilos) steak for anyone that can eat it in one hour. 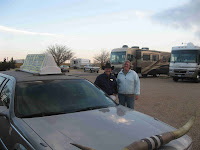 The restaurant provides a free limo pick up from the campground and a free desert. So off we went. Unfortunately, we forgot the camera, so we were unable to capture the atmosphere of wild life mounted on the walls and the layout reminiscent of an old west bordello. It was a huge place with mostly family style seating. A table was setup on a platform, similar to that for a bride and groom at a wedding, for those that accept the challenge of eating the 72 oz steak. They also have a hotel, where you can recover after the challenge is done. Our waiter said that they have had at least one taker every day and that about ten percent gets the meal free. We had a nice meal consisting of a standard size steak and a piece of carrot cake that has taken two days for the two of us to eat. 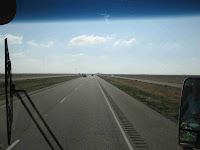 To fill in the picture gap, I have included a few shots of the trip from Amarillo to Oklahoma City. 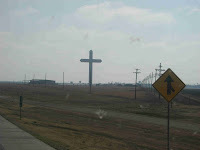 Included in these are scenes of life on the road and a quick picture of the largest Cross in the Western Hemisphere (or so the sign indicated). 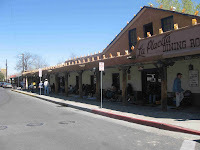 We spent a few days in Albuquerque to wait for improved weather along our route and to see the local sights. Our first impression was not that impressive, as everywhere we went were warnings about securing your personal property against rampant local crime, even at a national monument. We also noted that every building in town had security bars on all the doors and windows. We visited the old town section of the city which was the original site of the settlement started in 1706. Needless to say that this section is now devoted to tourist restaurants and gift shops. It was never the less a pleasant change from the modern city environment. We then headed to the Petroglyph National Monument, which preserves over 20, 000 thousand Petroglyphs that may be as old as three thousand years. Most are thought to be 400 to 700 years old. These in most cases are the only written history left behind by these people. The meaning of some of these images is lost to us but others are still used by native people today. There are several miles of hiking trails available to enjoy these glimpses into history. Watch out for rattlesnakes which are very much in evidence in the rocks. 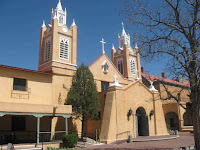 Finally, we took the scenic drive listed in the American byways book known as the Turquoise Trail which provides great views of the valleys around the Scandia Mountains and also takes you to the old mining town of Madrid. This is an early 1900’s coal mining town that has –you guessed it-turned itself into an artist colony and want to be tourist trap. It is nowhere near the level of Jerome or a number of others we have been to, but its “real” feeling was enjoyable. 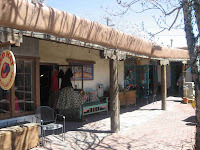 We spent almost an hour talking with one of the shop keepers who was a refugee from the hectic life of California, who just loved the life here in the New Mexico wilderness. The town population is around 400 and there is no mad growth spurt on the horizon. We spent an enjoyable afternoon wandering the single street and mixing with the locals.